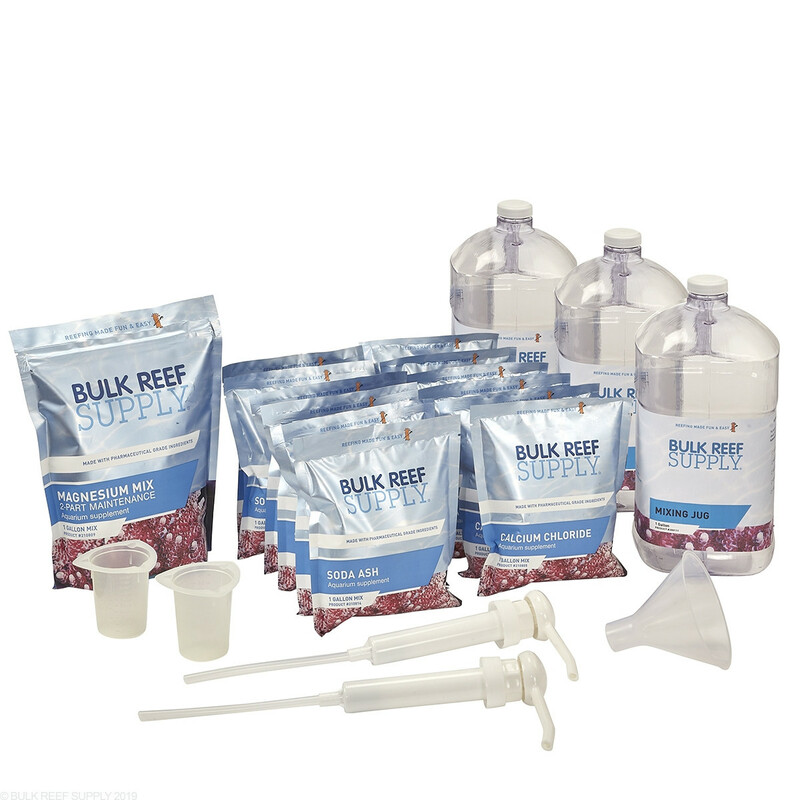 The 2-Part Calcium & Alkalinity Total Package comes with pre-portioned pouches of calcium, alkalinity, and magnesium to make your own 2-part liquid dosing solutions, even the gallon mixing jugs and dispensing pumps are included. Just pour one of each pouch into separate mixing jugs, top them off with water, and you are ready for daily 2-part dosing. Making your own two-part solutions lets you know exactly what you are adding to your aquarium, while also saving money. Each BRS Pre-Portioned Total Package includes 6 pouches of BRS Pharma Calcium Chloride, 6 pouches of Pharma Soda Ash, and a 1-gallon mix of Pharma Magnesium for 2-Part Maintenance. Even though you can probably find more concentrated solutions on the market, the BRS additives are formulated to be dosed in a 1:1 ratio (calcium:alkalinity), keeping dosing simple and measuring minimal. BRS Calcium Liquid Solution - Fill one of the 1-gallon mixing jugs 4/5 full of RO/DI or distilled water and then add the entire contents of 1 pouch into the container. Secure the cap on the container and shake it for about 10 seconds to help start the dissolving process. Remove the cap and fill the container the rest of the way with RO/DI or distilled water. Give the container a few more shakes and then let it sit until all the salts have dissolved before use. BRS Soda Ash Liquid Alkalinity - Fill one of the 1-gallon mixing jugs 4/5 full of RO/DI or distilled water and then add the entire contents of 1 pouch into the container. Secure the cap on the container and shake it for about 10 seconds to help start the dissolving process. Remove the cap and fill the container the rest of the way with RO/DI or distilled water. Give the container a few more shakes and then let it sit until all the salts have fully dissolved before use. BRS Magnesium Mix Solution - Fill one of the 1-gallon mixing jugs 1/2 full of RO/DI or distilled water and then add the entire contents of the package into the container. Secure the cap on the container and shake it for about 10 seconds to help start the dissolving process. Remove the cap and fill the container the rest of the way with RO/DI or distilled water. Give the container a few more shakes and then let it sit until all the salts have fully dissolved before use. Really easy to use and kinda fool proof. Really works great! You can't possibly beat the value in this product. If you are contemplating purchasing, do it! Do it now! BRS has excellent videos explaining the usage and mixing, calculator is solid. Buy this now! 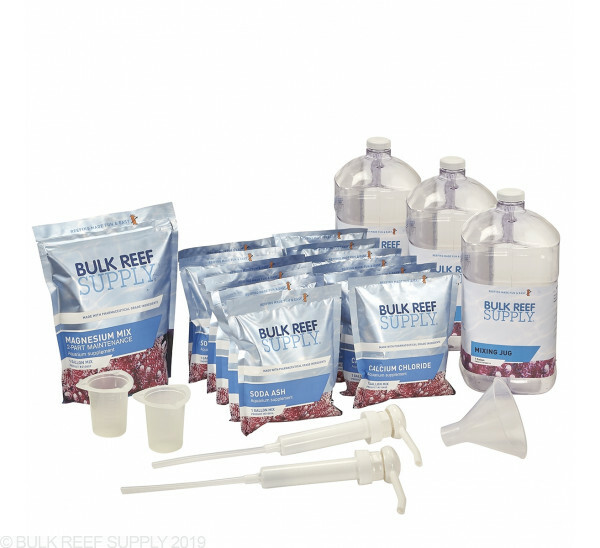 BRS 2 Part Calcium & Alkalinity and the dosing system has made maintaining proper levels very easy.